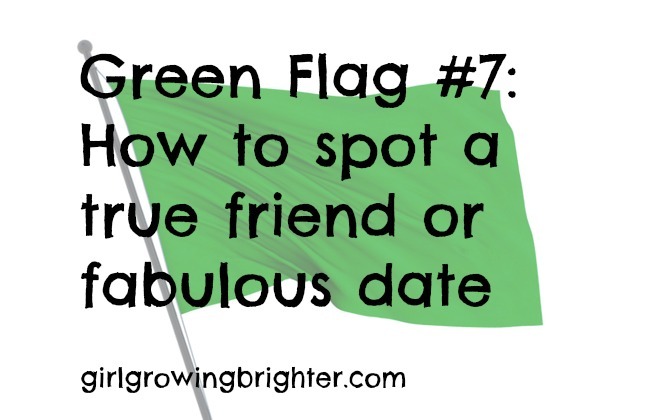 Green Flag #7: Good friends and partners genuinely, truly, share your joy with you. As good friends do, I would cheer this friend on enthusiastically, even though their accomplishments and good news had no bearing on my own life. Why? Because that is what you do for a friend. You genuinely share in their joy with them. A potential true friend and/or good partner does not treat you like an ATM machine of goodwill that they can withdraw from endlessly, without giving back any reciprocal energy. A person who truly cares about you, celebrates with you. ……and the list goes on…..
And THAT, my friends, is the person to get to know. They will most likely be a good, true friend to you. ****+ To be honest, I’m not quite sure how to mask identities if I’m detailing the time that I walked into a well-lit bar with my friend (in her mid 20’s), and she saw her ex-boyfriend (from when she was in high school). She then freaked out and hid in the corner of the bar, using me as her human shield. I mean, it’s not like that happens to everyone. I could call her “Barbie” or “Beyonce” and she’d still know it was her. ****^^ L and C, don’t be mad at me for employing the same, aforementioned poor anonymization process I say I won’t use anymore. I called you “amazing,” see, that’s a good thing! ****## The person I refer to was obviously not interested enough in me to learn anything about me. Therefore, they have no idea that I am now vaguely describing them to people around the world. So, if you’re wondering about anonymization, no worries!